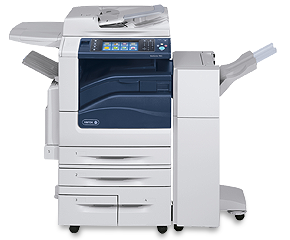 This Xerox WorkCentre 7845i is a great all-rounder capable of high print volumes. It offers copy, scan and fax functions. Built in classic Xerox blue and white, with smooth lines and a functional overall look, the Xerox WorkCentre 7845i is a multifunction colour laser printer with a deceptively small footprint. The machine measures 64 centimetres wide by 69.9 centimetres deep by 1 metre 14.9 centimetres tall, and weighs in at a rather hefty 151.9 kilograms. The freestanding castor-mounted unit features a top output tray and control panel, so it will need additional clearance overhead when being placed in the office. A backlit, full colour LCD display gives easy-to-read task status updates and shows inputs from the control panel, which features classic push button input. Front-loading paper trays and cartridge access complete the design. The Xerox WorkCentre 7845i benefits from an impressive maximum monthly duty cycle of 200,000 pages, with a generous recommended monthly volume of 16,000 to 20,000 pages. For colour printing, the machine goes from start to first A4 single-sided page printed in as little as 7.5 seconds, which is further reduced to 6.4 seconds for the first page of black and white single-sided A4. After this, the Xerox WorkCentre 7845i prints at speeds of up to 45 pages per minute in both colour and monochrome (the speeds are based on text only pages – printing will be slower if images are included). This multifunction machine can print images at resolutions up to 2,400 x 1,200 dpi, while the integrated copy function can achieve resolutions of 600 x 600 dpi. The unit also benefits from an integrated scanner and fax function, and it meets the criteria for EPEAT, Energy Star and Blue Angel energy efficiency. To achieve full input capacity of the Xerox WorkCentre 7845i, you will need to purchase optional extra trays or feeders.